It ain't easy to find the best car battery for your car. Well, if you count with the help of an expert, then it gets a lot easier. I'm going to review the top 5 car batteries on the market in 2018 and give you a side-by-side comparison to help you out find the perfect battery TODAY. The G4W theam has spent over 200 hours researching and testing to come up with this recommendations, so I really hope you find it helpful! They last for a really long time. Why Replace The Car Battery? If you've read anything about batteries before landing here, then you already knew I was going to talk about Optima. The Red Top, is my go-to battery whenever I have to do a service for someone who's battery died and needs a pickup. Affordable, and best quality around. Let's have a look at the specs of this LSI battery and you'll see why I never hesitate to recommend it. For the specifications of this particular battery, you’re going to get a 12-volt battery with 800 cold cranking amps and the measurements of this particular battery are 10” x 6 7/8" x 7 13/16” and it has dual SAE & GM posts as well. 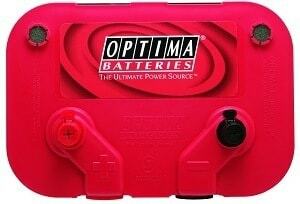 Optima Batteries use an exclusive technology that makes them the top player right now. It is called Spiralcell. It also comes with a reserve capacity of around 100 minutes of constant performance and the battery also is sure to deliver you optimal starting power no matter what conditions it might face, including extreme cold temperatures and bad weather. One of the biggest problems with some batteries lies in the fact that the vibration of the car can cause some serious problems to the battery. However, this battery is fifteen times more resistant to vibrations, which makes it a great choice for strength and durability. When it comes to fitting, as always, make sure you know the size of your battery box, and that you know on which side you have your Positive and Negative terminals. You can use Amazon's "will it fit" tool right at the page where you check out the price using the button below. If it gets fully discharged (lights left on) it can mean the end of its useful life. Another absolute best seller is the Yellow Top from Optima. And it's quite clear why: They rock. Meant for deep cycling, this is the perfect battery for those with a lot of lightbars and leds and foglights and sound systems and what not on their cars. Being just slightly more expensive than the Red Top, we would call this one the Best Car Battery of the year, overall. Once again talking about the specifications of this particular battery, you’re going to enjoy a 12 volt battery with 650 cold cranking amps. It weighs in at a pretty average weight of just over 36 pounds and it measures 9 5/16” x 6 13/16” x 7 5/8". When it comes to the measurements, always make sure that you measure carefully or consult a guide to make sure that it is going to fit your vehicle properly. This battery also has a 98 minute reserve capacity so that it can deliver consistent performance to your car without skipping a beat. Similar to the battery above this one, it also has a new feature that allows it to be 15 times more resistant to the vibrations that it experiences in the car, which means that it is going to do it’s job much more efficiently. The battery is also wired to make sure that you’re going to have optimal starting power no matter what situation you might find yourself in. Whether it is cold weather or just bad weather all around, the battery should start up with little to no problems at all thanks to the cold cranking amps included in the battery. Less CCA than the Red Top. When it comes to buying a battery for your car, you might want to consider buying one of the cheaper batteries on the market because odds are good that you’re not gonna wanna spend a ton of money. The Odyssey PC680 is probably the best car battery for the money and it does offer some features that you’re going to appreciate. Specifically, the warranty offered on this battery is one of the best out of any other battery that we reviewed on this post. It comes with a limited 2-year full replacement warranty so that if anything goes wrong and it is covered by the warranty, you will receive a full replacement, not just parts. The CCA on this battery is definitely one of the lower ones out of what we have reviewed so far but it does have a longer cycle life because when compared to other batteries, it is an average of 70% longer than the conventional batteries that it was compared again and it has up to 400 cycles at 80%. When compared to any sealed lead battery on the market, you’ll find that this battery has the highest recharge efficiency out of any of the other. It will recharge 100% in just 4-6 hours and can be mounted flexibly and has a non-spillable design. The measurements of this particular unit come in at 7.3” x 3.1” x 6.7”. 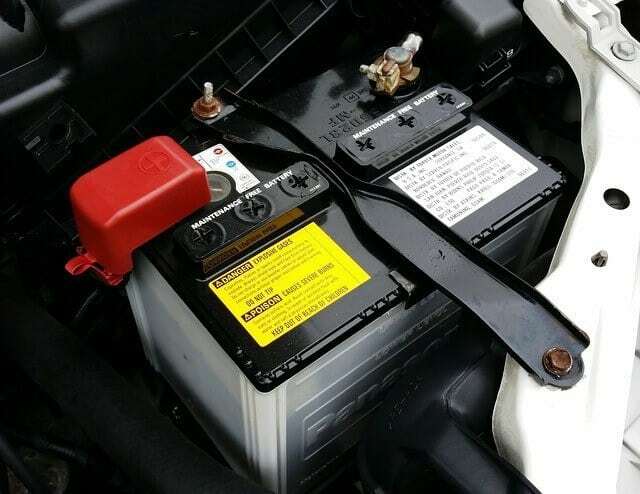 In addition to everything discussed above, this particular battery also has vibration resistance, so that it will be protected against high impact shock and vibrations that are caused by the movement of the car. Additionally, temperature has no effect on this battery as it is resistant to most extreme temperatures. We name this battery the best car battery for the money. Short on CCA, not the best choice for extreme cold environments. This is our recomendation for truck owners. With 800 CCA, starting a big fat diesel engine will be no problem even on extreme cold weather. And with those powerful 140Ah, you can power a 22" lightbar, or a badass subwoofer with zero trouble, no dimming headlights... nothing. Just power! A massive lot of value for your money with this AC Delco AGM battery. We really like AC Delco for heavy duty tasks. This battery has a high density negative pasts and it works to improve the performance of the battery while also increasing the longevity and the life of it as well. The enhanced life alloy and silver calcium stamped allot not only looks great but it also helps to increase the cycle life and the overall performance of the battery as well. In addition, the calcium lead positive grid means that conductivity is maximised and allows for some of the lowest resistance. As if all of those features weren’t enough to sell you on this particular product, you’re going to love the Robust Envelope Separator that has a puncture-resistant back to allow for more acid circulation and less shorts. The reasons for this is because the battery is kept much cooler, meaning that it will have a longer life and will not have to work as hard as a hot battery might have to. This particular unit measures in at about 12.4” x 6.9” x 7.5”, so make sure that you take the time to measure your vehicle and make sure that this battery fits in there perfectly. While it isn’t a huge deal with the exception of carrying it to the car, the battery weighs about 51.6 pounds, which makes it one of the heavier choices on the list. One of the heaviest choices. Really big, make sure it fits! If you want a deep cycle battery that can provide exceptional power, then the XS Power D6500 is an excellent choice. It can be used to replace your starter (terminals not included), or it can be a backup if you need extra juice to power your muffins car audio setup. Because this unit provides so many amps, it’s perfect for vehicles that have an extensive car audio system. What I like about this battery the most is the fact that it uses absorbed glass mat technology. Unlike standard lead plate models, this prevents any leaking or spilling, which means that you can mount it practically anywhere. Also, it’s ultra low resistant so that you get more efficient power and output every time. On the other hand, the intensity of this battery is also a downside. If you don’t need this many amps or this much power, you are paying too much. Also, it is larger and heavier than most other batteries, so it can be a pain to install. As such, it’s worth it if you have a system that needs it, but it would be overkill otherwise. Perhaps one of the better values out of any of the other batteries that were reviewed on this post, this particular battery is available at a very affordable price and we have even found that it can really make a difference if you decide to want to save some money but still get a good battery. There are several different battery models available, which is really helpful because that means the odds are good that you’ll be able to find the perfect size fit in your vehicle. For the sake of ease, the remainder of this review is going to discuss the HC800 BLU﻿ model, which measures in at about 6.5 inches by 8 inches by 5.5 inches. Since it happens to be one of the smaller batteries, it weighs in at just 23 pounds, one of the lightest out of all the ones on this post. The looks of the battery is second to none as it comes in a beautiful black case with a blue logo that looks great from just about anywhere. Additionally, this particular battery has an 800 watt maximum power cell along with a 12V high current power cell to make sure that you’re really getting everything that you can out of the battery. The design of this battery is great in the fact that it has a sealed absorbed glass mat design which means that you get a great battery that is built to last. This is a great choice as a secondary or auxiliary battery if you run a powerful car audio setup. No matter where you live, your car battery is going to undergo a lot of wear and tear. However, cold climates are especially painful for these systems, so you must be prepared. Were you aware that at 32 degrees Fahrenheit batteries lose 35 percent of their power? The colder it gets, the less efficient your battery operates, which can cause a lot of problems if you don’t have the right model. One of the most important things to look for in a cold weather battery is the amount of cold cranking amps. The higher the number, the better, as it will ensure that you don’t have to worry about your car failing to start. Also, you want extra reserve capacity and, if possible, a battery that won’t leak. Lead plate units have liquid inside that can freeze and cause cracks, so I prefer absorbed glass mat instead. Here are my top three picks for cold weather batteries. 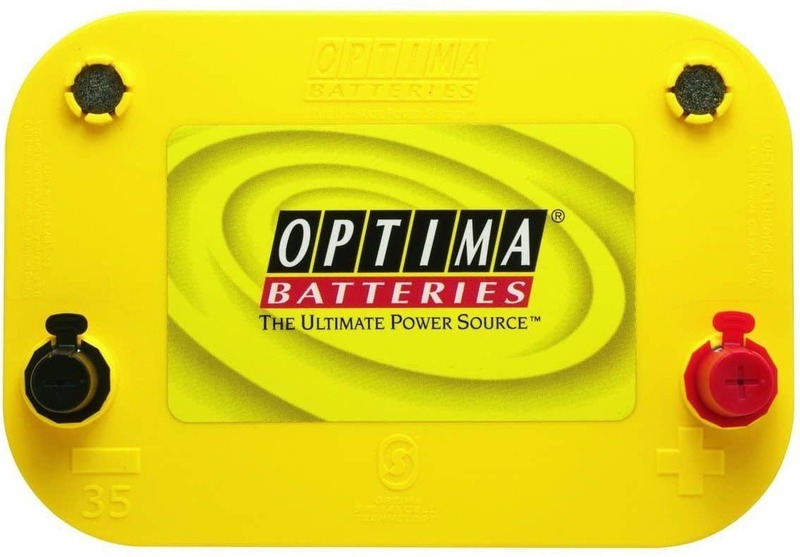 The Optima Yellow Top Battery has a spill-proof design that is incredibly sturdy and made to resist impact, shocks, and vibrations. It also has a durable outer shell that is perfect for keeping your battery working well, even when your car is running at below freezing temperatures. What I also like about Optima batteries, in general, is how they are constructed. They utilize both absorbed glass mats and spiral cells to provide more power with better efficiency. It also ensures that they won’t get damaged easily, particularly if you drive on uneven terrain. This yellow top is also remarkable because it is a deep cycle battery, meaning that it will work better for operating more electronic systems in your car. This particular battery is built to take on the stress of hard driving as well as high electrical demands. This battery was made for stop and go traffic situations, which makes it an excellent choice for big city driving. Exide puts this battery through the most intense automotive stress tests to make sure that it can show sustained performance within your vehicle. As you can see, this unit also has more cold cranking amps, which is why it works well in lower temperatures. 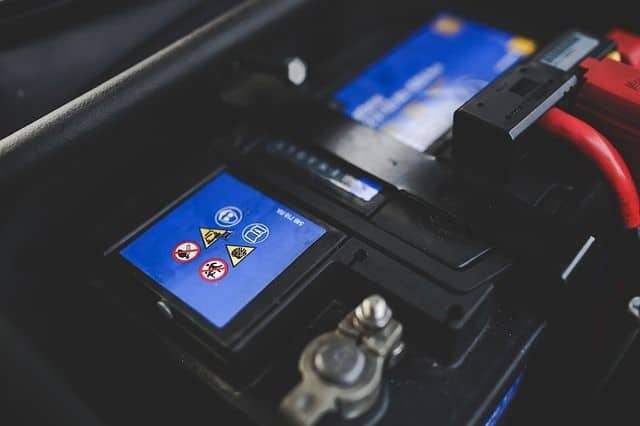 Unlike the Yellow Top, this is considered a starter battery, which means that it won’t provide as much energy to power electrical systems in your vehicle. This battery is 100 percent made in the USA. It boasts a faster recharge time than other conventional car batteries in the same category and will start your car quickly every time that you turn the ignition. This battery can cycle over 900 times to a 50 percent depth of discharge. When comparing this model to the other cold climate batteries, it’s clear that this one outperforms the rest. With 1150 cold cranking amps, you can get your vehicle started in practically any conditions. The only downside is that this battery is massive, weighing over 70 pounds, so plan accordingly. If you love to listen to music, then you might have installed a new sound system for your car. However, while upgrading your speakers and radio will enhance your overall listening experience, it also puts a lot of pressure on your battery. Most cars come with a starter model, meaning that they can be drained quickly when you have extra electronics running. As such, you need a deep cycle battery that can provide more energy overall. With these models, the most vital components are the amount of amps they produce, as well as their construction. You want a battery that’s energy efficient and comes with ultra-low resistance. Also, be sure that it’s insulated against vibration so you can crank up the bass. You can see some other recommended batteries for car audio here. This powerful 12-volt battery is built to provide plenty enough power for your stereo system. It is vibration resistant and low maintenance so that you just have to set it up and let it go to work for your vehicle. You can use it as an additional power source or replace your current starter, but if you do that you will need to buy terminals to make it work. Overall, this battery is built for high-performance speakers, which is why it provides so many amps. As such, if you’re not planning on going all out with your sound system, you probably won’t need to spend so much on something this intense. This Kinetic battery was built for providing power to the audio system of your vehicle. It is versatile in size and balanced so that you can mount it in virtually any position. It is a super dense battery, resistant to vibrations and heat. Like the XS Power above, this is another high-performance model. It’s tightly packed to ensure better energy efficiency, and it comes with an ultra-low ESR rating as well. I like that it uses absorbed glass mat technology, as well as the fact that it’s maintenance free. This powerful audio battery is contained in a protective, sealed AGM design that keeps your battery from leaking or spilling out. This battery can also be used as a replacement for your vehicle’s standard battery. However, since it is sealed and leak proof, you can mount it practically anywhere, meaning that it could work as an additional power source as well. Now if you own a car, some basic understanding about the battery does come in handy. Specially to help you identify obvious signs that the battery is going to give up on you, or a simple question such as: Do they need maintenance? We know it is hard to keep track of everything you should know about your car. From the battery to engine oil to tire pressure to winter emergency kits to how to replace headlights... It all can be a bit daunting. But don't worry, it really isn't that much, nor that hard! On this section, you'll find enough information to help you buy the right battery for you car. This is perhaps the most obvious reason when it comes to trying to figure out why you might need a replacement. You go turn the ignition one morning and nothing happens. Now of course it could be you left one light on during the night, couldn't it? But if this happens a few mornings in a row... Sorry, your battery has left this life. It Keeps Failing and How to troubleshoot a battery that fails. Actually, before that first scenario happens, we're very likely to find this one first. It is extremely important to spot this signs when they happen so we can work in advance and replace the battery before it left us stranded the day we are really late to work or we've got a flight to catch. Sign 1: When we turn the ignition key, the engine cranks slowly. Engine does turn on but it seems to have a hard time staying like that, and you percieve the lights dimming. Either battery is close to die, or the alternator isn't charging. There's one quick way to troubleshoot the latter: Get your multimeter and measure volts on the battery terminals when the engine is on. Should be 13.8v on idle and 14.7v if you give it some gas. If it is lower than that, it's the alternator. Alternator charges good? Then get yourself a new battery. Upgraded Car Electronics or other electric features. When we add extra electronic equipment to our cars such as a new stereo, perhaps a fancy double din unit with GPS, and maybe a 4 channel amplifier to power up those brand new﻿ speakers you got on Amazon and you're thinking of getting a subwoofer too to get that final depth of sound to enjoy every track as if it were live in concert, you may want to upgrade your battery. Not just that, but electric powered doors, aftermarket heated wing mirrors, light bars and such stuff increase the electric consumption and you need a bigger, more powerful source. When it comes to battery types, there are essentially two main types that you’re going to need to know about. Those are the lead acid batteries and the AGM batteries. The lead acid batteries have both Starting and Deep Cycle batteries. The starting is designed to give quick bursts of energy while the deep cycle has less instant energy but it is a greater choice for long-term energy. AGM batteries are short for Absorbed Glass Mat and that essentially means that it allows the electrolytes to remain suspended closely to the plates active material. This works to enhance both the recharge and the discharge efficiency so that you get a better overall experience with your battery. When talking about car batteries, CCA stands for Cold Cranking Amps. If you don’t know what that means, essentially it is measured by testers putting the battery in a cold climate and then measure how large the discharge load is for a new, charge battery in 30 seconds. The reason a cold climate is chosen is because often times, a battery is going to be at it’s worst performance condition when it is in the cold climate, so if it performs well in the cold, then it should perform well in just about any situation. Despite the importance of the CCA when it comes to cold temperatures, it is probably not worth basing your decision on that particular unit of measure. However, if you live in a climate that is cold for a considerable amount of time, you should put a lot more weight into the CCA than anyone else. For car batteries, Ah stands for amp hour and is a standarized measure for batteries. Typically, you’re going to find that the amp rating is taken for 20 hours. So if you have a 100 Ah rated battery, that means that for 20 hours, it will draw about 100 amps, which would then translate to about 5 amp hours. Now that you have an idea of some of the best car batteries in 2018 let’s take a closer look at some of the top brands. Product Lines: Bosch makes a ton of various items. For a full listing of their products and lines, be sure to take a look at their website. Reputation: They are widely recognized as one of the biggest automotive parts retailers around the globe. If you have a high-demand system such as, lets say, four 70w RMS speakers powered by a 4 channel ﻿﻿﻿﻿﻿amplifier and a monoblock amplifier for a 2000w RMS 12 inch subwoofer and a 24" lightbar and xenon headlights... a regular battery won't serve you. 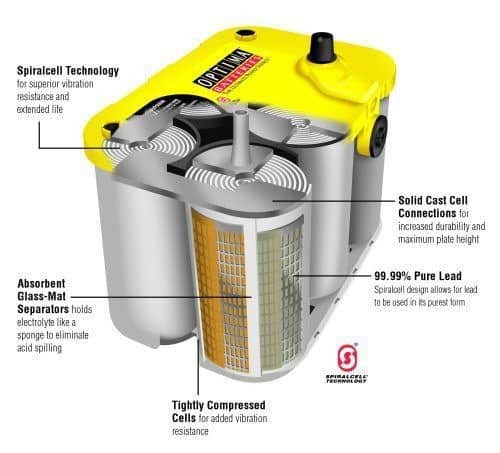 You are looking then for a deep-cycle battery such as the Optima Yellow top, and most likely an auxiliary battery like the Kinetic HC800 to power all that. Besides, such a big setup will require you to upgrade﻿﻿ the big 3 if you really want to get the most out of your system. Know how power-hungry (watts) are the aftermarket components you install in your car. Get a battery that will power it accordingly or you're in for some baaaad performance. As you can see, there is a lot of thought and consideration that needs to go into choosing a car battery. Whether it has to do with the total output you’re looking for or the size of the battery, it can be tough if you have never done something like this before. 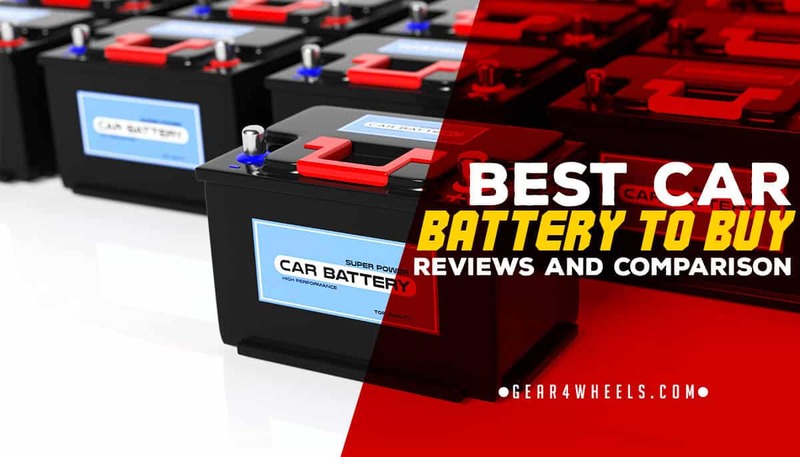 Above is a great guide to make sure that you find everything you could possibly need when it comes to buying the best car battery. If you have any questions, just write a comment below! We've Spent 100+hours researching and testing batteries so you don't have to. Here are the only 5 we would truly recommend and buy ourselves. Do you think Optima’s yellow is better for a big (4000w RMS) car audio setup or shall I go for the XS Power?? For such a powerful setup I’d definitely go for the XS Power 3400, maybe even back it up with a Kinetics on the trunk if space/budget allows and an upgrade of the big 3 is totally necessary. I think the topic is quite interesting so I’ll write a quick article about it, but on the meantime I’ll tell you this. Lead acid batteries corrode because of the gases generated by the sulphuric acid. AGM or Gel batteries don’t. I’ll get into greater detail in the article. It will be live tomorrow! Here you go, here’s the article finished! I have a 1968 camaro with a high compression 396 big block. It is hard to start when it is warm or hot, but fires right up when cold. I put a heat shield around the starter, which helps but not enough. What battery would you recommend? Yellow top all day long. That and probably insulating the battery box the best you can do, but sounds like you’ve already done some stuff there. Have a look at the wiring tho, make sure it’s in good condition and that the gauge is not too thin. Why not the redtop, which I thought had more initial starting power. The battery cables are new.